Nusa Dua, 21 October 2016 – Samabe Bali Suites & Villas, Bali's 5 star luxury all inclusive resort, is honored to be among the winners of the prestigious Haute Grandeur Awards 2016 as Best All Inclusive Resort. It has been competed against numbers of hoteliers to be aligned with other upscale hotels in the world. The awards were announced at a high profile gala and presentation dinner at Fairmont Bab Al Bahr in Abu Dhabi on 20 October 2016. Haute Grandeur Awards is the international 5-star standard hotel rating which is recognizing exceptional contributions by outstanding hotels across 7 continents, 172 countries and 90 categories. 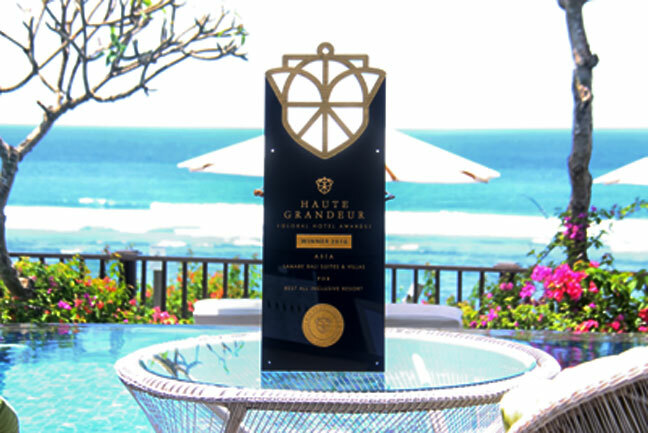 In attaining, one of these categories in The Haute Grandeur Awards, Samabe Bali Suites and Villas has proven its capability to outperform some exceedingly strong competitor within the international hospitality arena. With this latest new title, Samabe Bali Suites & Villas continues to gain international recognition for its innovations. "We are very honored and pleased to be recognized in the prestigious The Haute Grandeur Awards as Best All Inclusive Resorts. It is truly highlights our dedication to creating experience that is incomparable and truly memorable for the guest during their stay, we are glad that our hard work has been proved by this award" Said General Manager of Samabe Bali Suites & Villas, Ralf Luthe. Situated in the secluded part of Bali, Nusa Dua, Samabe Bali Suites & Villas epitomizes the tranquility of a beach resort in lavish style. The resort sits on 8-hectare land with 81 suites & villas, 2 restaurants and 2 bars. Each suites & villas present stylish interior design with typical touch of Balinese art. The ocean view from every suite and villa boasts the opulence of the resort. Samabe Bali Suites & Villas, a luxury all inclusive resort, sits atop of the southernmost cliff of Nusa Dua. Introducing a new concept of all inclusive called "Unlimited Privilege", it offers unsurpassed luxury with unlimited food and beverage, Samabe Signature Activities, high quality amenities and facilities through its 81 suites & villas, private service from seasoned butler, and more. Samabe Bali Suites &Villas takes a stab at highlighting its guests' vacation in Bali.